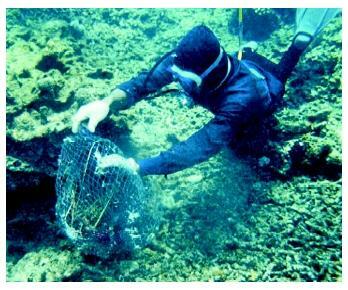 A marine biologist inspecting a coral reef in Indonesia that has been damaged by illegal fishing practices. to aid in resource conservation decisions. As land development increases, marine biologists are needed to determine its effects on surrounding habitats and whether an ecosystem can withstand human invasion. Marine biologists also find work worldwide teaching in colleges, universities, and even some high schools. Many work on oceanographic research vessels and in laboratories from polar to tropical settings. American Fisheries Society Jobs Center Online. <http://www.fisheries.org/jobs.html> . Scripps Institution of Oceanography. <http://www.sio.ucsd.edu/> . Woods Hole Oceanographic Institution. <http://www.whoi.edu/> .